Discover the center of the beautiful medieval city of Kaysersberg, this beautiful apartment 3 pieces. It has an entrance, a living room with lounge / living room, 1 kitchen, 2 bedrooms, 1 bathroom with shower and bath and 1 toilet. Living / Living room is facing south. Included in this room: a sofa bed (120 cm = for an adult or 2 children), a coffee table, TV stand, dining table with 6 chairs, sideboard, flat screen TV and documentation on activities and attractions in the region to discover. The kitchen, meanwhile, is fully equipped (oven, stove, refrigerator, microwave, coffee maker, toaster, dishes and utensils, etc.) with table and chairs. The first bedroom has a double bed (140x200), 2 bedside tables with lamps and a wardrobe. The second bedroom has two single beds, two bedside tables and a large dressing room. Each bed is equipped with a draw sheet, 2 pillows and duvet. The bathroom includes a cabinet with sink and storage, mirror, bathtub and shower. - 2 single beds for 2 in the second bedroom. Great location, but an apartment in need of updates. The apartment is located in a beautiful area with lovely views of the vineyards on the hills behind the house. The unit provides great access to the beautiful town center and the private parking place is very convenient. Also, there is plenty of space in the unit for our family of four. There is a lot of potential to make this a great place to stay. However, there are some upgrades needed. The bed in the main bedroom is smaller than it appears in the foto and the mattress is quite uncomfortable. The shower is quite old and the doors no longer function well. The handheld shower head no longer attaches correctly to its holder which means it has a tendency to fall on you while showering. The toilet is in a different/separate room than the sink/shower, which is a bit odd. Also, the windows are not very good at blocking out noise from outside, which means you are woken up by the loud and very near church bells every morning at 7am repeating at 15 minute intervals. Lastly, there is a bit of a strange bring your own bed linens policy (or get hit with an additional fee), which I haven't seen before on VRBO. This would be very inconvenient for people not travelling by car to the area. Thanks for this comment. Indeed this cottage is not a new built and renovated one but the prices are in adequation with the type of house and its excellent location in the center of Kaysersberg added with a private place of parking which is really rare in the very center of Kaysersberg. Concerning the handeld shower head in the shower we'll do our necessary to check it, no one has informed us about this till now. Thanks for this usefull information. 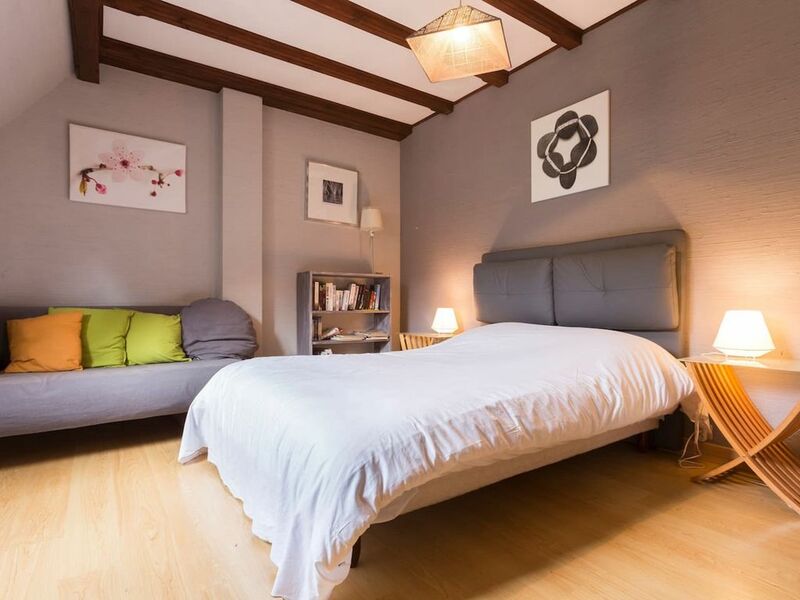 The photographs are similar to reality and the double bed offers standard french sizes (saying 140cm large). Regarding the separate toilet, contrary to your point of view, this is generally appreciated. Finally talking about our policy towards bed linen and towels, we let the liberty to travellers to book some or to bring theirs on their own. This is written in the ad and do not worry we do arrange ourselves quite well with people who need these suggestions. The fact that they are free to chose is also generally appreciated. We were happy to welcome you. Très bien situé, cet appartement correspond en tous points à sa description, avec de beaux volumes, très bien agencé et parfaitement équipé : rien ne manque et le parking dans la cour est très appréciable.Nous nous sommes sentis comme chez nous. L'agence est sérieuse, le personnel compétent, efficace et réactif. Nous ne doutons pas que les petites observations que nous avons signalées seront prises en compte et c'est avec grand plaisir que nous renouvellement ce séjour magique. Nice, clean and roomy apartment on third floor right downtown Kaysersberg. Beds were nicely made and comfortable. Parking within the gate was perfect and right in front of door to apartment building. Dish washer, oven and all other necessary things are there. We used the place as a base for our day trips into Alsace and Vosges mountains to have a relaxed dinner either in Kaysersberg or in the apartment which worked out nicely. Apartamento perfecto, muy espacioso y con todos los detalles necesarios para tener una estancia estupenda. Salón amplio, solo un sofá pero lo cierto es que tiene sillas de comedor al lado y el sofá es amplio. La habitación de matrimonio está realmente bien de espacios de armarios y de dimensiones e incluye un sofá que seguramente podrá ser cama. La cama es comodísima. Por lo demás cocina con office para vivirlo, baño super amplio con WC separado...lo peor la habitación doble, con un apaño extraño de un colchón en un lateral de una de las camas que no acabamos de entender. El pueblo es como de cuento y tiene una oferta gastronómica como para estar 2 semanas sin repetir y comiendo bien. La agencia es súper seria, completamente de confianza, rigurosos y detallistas, muy bien. You can start with a visit of Colmar and its famous Unterlinden Museum and a ride in the romantic neighborhood of Little Venice (why not take a boat ride on the canal). You can also discover a part of the wine route (by car, motorcycle or bicycle), lined with charming floral villages, wine cellars, good inns, authentic winstubs, and numerous castles. You will cross, for example, Kaysersberg, Eguisheim, Turckheim, Riquewihr etc. Spend half a day at the Ecomuseum of Alsace (lively open air museum that brings together 70 Alsatian peasant houses). Then go on the ridge road, or Haut-Koenigsbourg castle. Younger and older will enjoy the monkey mountain or storks park. Depending on whether you like cultural holidays, architecture, wellness, nature and recreation, this beautiful area will make you come back.